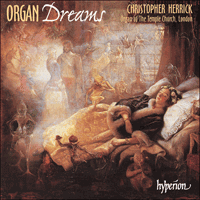 Christopher Herrick takes a break from his series of 'Organ Fireworks' to present an inspiring programme entitled 'Organ Dreams'. Recorded in The Temple Church in the heart of the City of London, this disc includes works by Walford Davies and Thalben-Ball who consecutively held the post of Organist at the Church earlier this century. The organ itself is a vintage Harrison instrument originally built for a Scottish stately home in the 1920s. After the War it was brought to London by Thalben-Ball. This is a rare recording of the instrument, and the repertoire chosen by Christopher Herrick is ideally suited to both the organ itself and the acoustic of the church. Born in Stuttgart, Sir Julius Benedict had a long and distinguished career as both pianist and conductor. He worked in Vienna and Naples before finally settling in London, where he gradually gained a reputation as a composer – most notably with his opera The Lily of Killarney. He studied with Weber and Hummel but his own music is more Italianate; the influence of Rossini was clearly stronger than that of his birthplace. March of the Templars, with its spiky principal theme and broader second subject, was played in 1887 as Queen Victoria entered Westminster Abbey for her Jubilee Service. This arrangement by W T Best, the celebrated organist of St George’s Hall, Liverpool, is typically flamboyant, reflecting his legendary reputation as a recitalist. Sir Henry Walford Davies became organist of The Temple Church, London, in 1898 and stayed for the next twenty years. There then followed four years of joint directorship with George Thalben-Ball before he finally handed over the reins in 1923. He studied composition with Parry and received encouragement and practical help from Elgar, but despite early success with the cantata Everyman, he never really fulfilled his early promise. In a wide-ranging career his true fame came as a choir-trainer and, most significantly, as an educationalist and popular broadcaster. Solemn Melody, his most famous composition, was written in 1908 for organ and strings. It is heard here in J E West’s arrangement for organ alone. The repeat of the melody, which develops to a climax for full organ, is enlivened by reharmonization and variations in the part-writing. William Spark was a colourful character and a prolific composer but it is for his writings, often witty and acerbic, that he is more likely to be remembered today. They paint a fascinating picture of musical life in England in the second half of the nineteenth century. He became an articled pupil of S S Wesley in his home town of Exeter in 1840. When, two years later, Wesley moved to Leeds, Spark went with him. He held several posts, culminating in that of St George’s, Leeds, in 1850. In 1859, with his friend Henry Smart, he designed the organ for the newly built Leeds Town Hall. It was one of the largest instruments in the country at the time, allowing them, during the course of its construction in London, to host a dinner inside its swell box. As the result of a competition held the following year and adjudicated by W T Best, Spark was appointed Municipal Organist. The result of the competition did not please everyone, particularly the residents of nearby Huddersfield – home town of a rival candidate – and accusations of dirty deeds led to heated debates at meetings of the Leeds Town Council. However, Spark kept the job and stayed until his death in 1897. After an introduction and straightforward presentation of the hymn-tune Jerusalem the Golden – this version of the tune has one note different to that in general use today – Spark’s four variations and fugal finale are cast in traditional mould, exploiting the characteristic colours of the Romantic organ. The quiet ending, with its written-out slowing down, is the more effective for being unexpected. Although his name has all but disappeared from the reference books, in his day Antoine Édouard Batiste enjoyed considerable fame. He held the post of organist at St-Eustache in Paris from 1854 until his death, and as one of the most popular recitalists of his generation was particularly noted for the breadth of his repertoire, as well as for his skill as an accompanist and improviser. Along with that of his contemporary Lefébure-Wély his music quickly went out of fashion, but even if it sometimes smacks more of the salon than the sanctuary, at its best it has great melodic charm and a certain ability to thrill. His most famous composition, the Andante in G, had no fewer than fifty separate English editions, including one for the unlikely combination of two mandolins and piano. William Spark, who thought well enough of Batiste’s organ works to edit them for English publication, was less enamoured of the man, describing him as a ‘fat, podgy, round-faced gentleman, full of glib conversation and anecdote’. The Offertoire in G major is in a lilting 9/8 with a rather more agitated middle section leading to a thunderous reprise of the main tune. William Lloyd Webber, the father of Andrew and Julian, was a distinguished recitalist and teacher. He was for many years organist of Central Hall, Westminster, and director of the London College of Music. Prelude, the first of Three Recital Pieces dating from 1952, develops its opening theme to a rhapsodic climax and then melts away towards a deliciously bluesy final cadence. In the triple role of performer, composer and successor to Franck and Tournemire at Ste-Clotilde, Paris, Jean Langlais was the inheritor of a grand tradition. His works of homage to Bach, Rameau and Frescobaldi place him in an even greater lineage. Written in 1951, the eight movements of Hommage à Frescobaldi invoke the spirit of the seventeenth-century Italian master – ‘a giant among organists’ – who inspired not only his own countrymen but also helped to shape the keyboard style of Buxtehude and Bach. The theme is in the bright triple time of Frescobaldi’s variation-form works, but with the modal inflections so characteristic of Langlais. The three variations are playful and skittish with a typically throwaway ending. César Franck stands as the polar opposite to Batiste and his like. Although even he could enter the knockabout world of his contemporaries when appropriate, his music is generally on a loftier and more spiritual plane. This elevated dimension is nowhere more evident than in the Trois Chorals, his last completed compositions. Written in the country while recuperating after an accident, they form a remarkable trilogy, each with its own distinctive colour and character. Choral No 1 in E major is the most opulent of the three, and probably comes closest to Vierne’s description of Franck’s improvisation: ‘A polyphony of incomparable richness, in which melody, harmony and structure vied with one another in originality and emotional conception, traversed by flashes of manifest genius.’ The opening pages provide the composer with a wealth of melodic material which he then develops, extends and transforms over the course of the three main sections of the work. A brief fantasia-like section links the second and third paragraphs; the third part occupies over half the length of the entire piece. Although at key structural moments the music is firmly anchored in E major, the fluency with which Franck filters his thematic material through the harmonic spectrum is quite breathtaking. The work ends in a triumphant blaze with the chorale-like theme which has ended each of its major divisions. Described by Parry as ‘the most beautiful tune in the world’, the traditional ‘Londonderry Air’ first appeared in print in the middle of the nineteenth century. The words most often associated with it, ‘O Danny boy’, are the work of Frederick E Weatherly. Paul Spicer has arranged it as Dreams of Derry specially for this recording, giving full range to his harmonic imagination. At one point the score is marked ‘louden lots’ in homage to an earlier arranger, Percy Grainger. In 1799 Ludwig van Beethoven made the acquaintance of the widow and daughters of the Count of Brunswick and was soon, as the teacher of the two young Countesses, an honoured guest at their country estate. At the instigation of her mother, Countess Josephine married Count Joseph Deym, the owner of the waxworks museum for whom Mozart had written his three pieces for mechanical organ. Beethoven himself was interested in all sorts of musical automata and wrote three pieces especially for the Count’s collection. The composer was particularly concerned with string quartet writing at this time, bringing to fruition the Six String Quartets, Op 18. The arching melodic lines of the Adagio in F major suggest a quartet slow movement, while the high degree of ornamentation betrays it as a work not originally designed for human hands. Sir George Thalben-Ball’s dedication of his Elegy to Walford Davies demonstrates the esteem and affection in which he held his predecessor at The Temple Church. Originally improvised at the conclusion of a broadcast Evensong, Thalben-Ball’s work takes the outline and characteristic intervals of Solemn Melody, making something quite fresh and affecting from them. The extraordinarily precocious Charles-Valentin Alkan won a Premier Prix in piano at the Paris Conservatoire at the age of eleven, and went on to take similar awards for harmony and organ. He enjoyed considerable success as a child prodigy and won the admiration of Schumann and Liszt, but for some reason he always felt himself to be in the shadow of the latter. He enjoyed the close friendship of many influential people, including Chopin and George Sand, but became increasingly withdrawn and unwilling to promote himself as either a pianist or a composer. Typical of his idiosyncratic behaviour was his decision to resign the post of organist at the Paris Synagogue before he had even taken it up, thus depriving himself of the use of a brand-new Cavaillé-Coll organ. Although the bulk of his output is for the piano – much of it requiring extremes of dexterity and stamina – he also composed several smaller-scale works for the pedal piano, an instrument for which he had a particular fondness. From the 13 Prières, Op 64, and the 11 Préludes, Op 66, both written around 1866, his friend and admirer César Franck selected ten pieces and arranged them for organ. In general the alterations he made were minor ones, consisting mostly of adjustments to the tessitura and figuration in order to make them lie more idiomatically for the organ. Prière No 11 in E major is pastoral in mood; the broader middle section bears the Nobilmente marking so beloved of Elgar. Né à Stuttgart, Sir Julius Benedict mena une longue et éminente carrière de pianiste et de chef d’orchestre, travaillant à Vienne et à Naples avant de finalement s’installer à Londres, où il s’acquit peu à peu une réputation de compositeur – tout particulièrement avec son opéra The Lily of Killarney. Il étudia auprès de Weber et de Hummel, mais sa musique est plus italianisante – l’influence de Rossini supplanta, à l’évidence, celle de son lieu de naissance. March of the Templars, avec son thème principal ombrageux et son second sujet plus ample, fut jouée en 1887 à l’entrée de la reine Victoria dans Westminster Abbey, pour le service de son jubilé. Le présent arrangement, typiquement flamboyant, reflète la légendaire réputation de récitaliste de son auteur, W. T. Best, le célèbre organiste de St George’s Hall, Liverpool. Sir Henry Walford Davies devint organiste de The Temple Church, Londres, en 1898. S’ensuivirent vingt années consécutives à ce poste puis quatre années de direction commune avec George Thalben-Ball, au terme desquelles il passa définitivement les rênes en 1923. Il étudia la composition auprès de Parry, reçut les encouragements et l’aide concrète d’Elgar mais, nonobstant le succès précoce de sa cantate Everyman, ne remplit jamais vraiment ses premières promesses. Musicien à la carrière variée, il fut surtout réputé comme maître de chœur et, fait des plus significatifs, comme pédagogue et comme homme de radio populaire. Solemn Melody, sa plus fameuse composition, fut écrite en 1908 pour orgue et cordes. Nous l’entendons ici dans un arrangement, pour orgue seul, de J. E. West. La répétition de la mélodie, qui se développe jusqu’à un apogée pour le plein-jeu, est animée par la réharmonisation et les variations dans la conduite des parties. William Spark fut un personnage haut en couleurs et un compositeur prolifique, même si son souvenir est désormais probablement attaché à ses écrits, souvent pleins d’esprit et acerbes, tableau fascinant de la vie musicale en Angleterre, dans la seconde moitié du XIXe siècle. Devenu élève-apprenti de S. S. Wesley à Exeter (sa ville natale) en 1840, il suivit son maître à Leeds en 1842. Il occupa plusieurs postes, dont celui de St George’s, Leeds, qui marqua son apogée, en 1850. En 1859, il conçut, avec son ami Henry Smart, l’orgue destiné au Leeds Town Hall, nouvellement érigé. Ce fut, à l’époque, l’un des plus grands instruments du pays, et ils purent, lors de sa construction à Londres, recevoir à dîner à l’intérieur de la boîte expressive du récit. Par suite d’un concours tenu l’année suivante et arbitré par W. T. Best, Spark fut nommé organiste municipal, ce qui ne fut pas du goût de tous, en particulier des résidents de la cité voisine de Huddersfield – ville natale d’un des concurrents –, et des accusations de sales affaires suscitèrent des débats enflammés au conseil municipal de Leeds. Spark n’en conserva pas moins son poste jusqu’à sa mort, en 1897. Passé une introduction et une présentation simple de la mélodie hymnique Jerusalem the Golden – cette version de la mélodie diffère d’une note par rapport à celle généralement utilisée de nos jours –, les quatre variations et le final fugué de Spark sont coulés dans le moule traditionnel, exploitant les couleurs caractéristiques de l’orgue romantique. La conclusion paisible, avec son ralentissement, est d’autant plus efficace qu’elle est inattendue. Quoique son nom ait presque disparu des livres de référence, Antoine Édouard Batiste jouit en son temps d’une renommée considérable. Organiste à Saint-Eustache de 1854 à sa mort, il fut l’un des récitalistes les plus en vue de sa génération, surtout connu pour l’étendue de son répertoire, ainsi que pour ses talents d’accompagnateur et d’improvisateur. À l’instar de celle de son contemporain Lefébure-Wély, sa musique passa rapidement de mode mais, même si elle sent parfois plus le salon que le sanctuaire, elle recèle, dans ses meilleurs moments, beaucoup de charme mélodique et une certaine capacité à émouvoir. Sa plus célèbre composition, l’Andante en sol, ne compte pas moins de cinquante éditions anglaises distinctes, dont une pour l’insolite combinaison de deux mandolines et piano. William Spark, qui estima suffisamment les œuvres pour orgue de Batiste pour en préparer la publication anglaise, fut moins épris de l’homme, le décrivant comme un «gros monsieur replet, au visage rond, beau parleur et débordant d’anecdotes». L’Offertoire en sol majeur, sis dans un mélodieux 9/8, présente une section centrale plutôt plus agitée, qui conduit à une reprise retentissante de la mélodie principale. William Lloyd Webber, le père d’Andrew et de Julian, fut un éminent récitaliste et professeur, longtemps organiste de Central Hall, Westminster, et directeur du London College of Music. Prelude, la première des Three Recital Pieces (1952), développe son thème d’ouverture jusqu’à un apogée rhapsodique avant de s’évanouir vers une coda délicieusement teintée de blues. Tout à la fois interprète, compositeur et successeur de Franck et de Tournemire à Sainte-Clotilde, Jean Langlais fut l’héritier d’une grande tradition, amplifiée par ses hommages à Bach, Rameau et Frescobaldi. Écrits en 1951, les huit mouvements de son Hommage à Frescobaldi en appellent à l’esprit du maître italien du XVIIe siècle – un «géant parmi les organistes» –, qui non seulement inspira ses propres compatriotes mais contribua à façonner le style pour clavier de Buxtehude et de Bach. Bien que sis dans la brillante mesure ternaire des œuvres de forme variation de Frescobaldi, le thème comporte les inflexions modales si caractéristiques de Langlais. Les trois variations, enjouées et frivoles, présentent une conclusion typique, jetée là comme par hasard. César Franck apparaît comme aux antipodes de Batiste et de ses pareils. Même s’il put, le moment opportun, pénétrer l’univers turbulent de ses contemporains, sa musique se situe généralement sur un plan plus élevé, plus spirituel. Cette dimension n’est jamais aussi évidente que dans les Trois chorals, ses dernières compositions achevées. Écrits à la campagne, alors qu’il se remettait d’un accident, ils forment une remarquable trilogie, chacun avec ses propres couleur et caractère. Le Choral no1 en mi majeur, le plus opulent des trois, est probablement le plus proche de la description que Vierne donna de l’improvisation de Franck: «Une polyphonie d’une riches se incomparable, dans laquelle mélodie, harmonie et structure rivalisent d’originalité et de conception émotionnelle, traversées par des éclairs de génie manifeste». Les pages d’ouverture offrent au compositeur une profusion de matériau mélodique, qu’il développe, élargit et transforme au fil des trois principales sections de l’œuvre. Une brève section de type fantaisie relie les deuxième et troisième paragraphes; la troisième partie occupe plus de la moitié de la durée de la pièce. Quoique la musique soit fermement ancrée dans le mi majeur aux moments structuraux clé, l’aisance avec laquelle Franck filtre son matériau thématique à travers le spectre harmonique est proprement époustouflante. L’œuvre s’achève dans un flamboiement triomphant avec le thème de type choral conclusif de chaque grande division. Décrit par Parry comme «la plus magnifique mélodie au monde», le traditionnel «Londonderry Air» fut publié pour la première fois au milieu du XIXe siècle. Les paroles qui lui sont le plus souvent associées, «O Danny boy», sont de Frederick E. Weatherly. Paul Spicer l’a arrangé sous le titre de Dreams of Derry expressément pour cet enregistrement, donnant toute la mesure de son imagination harmonique. À un endroit, la partition est marquée «louden lots» en hommage à un arrangeur antérieur, Percy Grainger. En 1799, Ludwig van Beethoven fit la connaissance de la veuve et des filles du comte de Brunswick et devint bientôt, en tant que professeur des deux jeunes comtesses, un invité honoré de leur domaine. À l’instigation de sa mère, la comtesse Joséphine épousa le comte Joseph Deym, propriétaire du musée de cire pour lequel Mozart avait écrit ses trois pièces pour orgue mécanique. Beethoven s’intéressa, lui aussi, à toutes sortes d’automates musicaux et composa trois pièces spécialement pour la collection du comte. Le compositeur, qui se souciait alors tout particulièrement d’écriture pour quatuor à cordes, réalisa les Six Quatuors à cordes, op.l8. Les lignes mélodiques arquées de l’Adagio en fa majeur suggèrent un mouvement lent de quatuor, cependant que le haut degré d’ornementation trahit une conception originelle pour des mains non humaines. La dédicace de son Elegy à Walford Davies atteste l’estime et l’affection dans lesquelles George Thalben-Ball tenait son prédécesseur à The Temple Church. D’abord improvisée à la fin d’un evensong radiodiffusé, cette œuvre de Thalben-Ball adopte le plan d’ensemble et les intervalles caractéristiques de la Solemn Melody, pour un résultat tout à fait frais et touchant. Nous avons peine à imaginer combien la première chaotique de The Dream of Gerontius, en octobre 1900, fut dévastatrice pour Elgar, qui y avait mis tant de son âme. Malgré les encouragements d’amis proches, qui avaient saisi la véritable valeur de l’œuvre, les défaillances de l’interprétation plongèrent le compositeur dans les tréfonds du désespoir. Même quand son ami intime Ivor Atkins programma le Prelude dans un récital d’orgue à Worcester, une semaine à peine après l’exécution de Birmingham, il alla chercher consolation au golf, trop bouleversé pour y assister. Deux ans d’exécutions triomphales en Allemagne, à Sheffield et au Three Choirs Festival de Worcester effacèrent cependant presque le souvenir de ce jour effroyable; le reste n’est qu’histoire. L’arrangement pour orgue de The Angel’s Farewell, publié par Novello, est de Herbert Brewer, organiste de Gloucester Cathedral et autre ami intime d’Elgar, dont il fut l’un des champions. Lorsque l’ami d’Elgar chez Novello, A. J. Jaeger (le sujet de la Variation «Nimrod»), entendit pour la première fois le compositeur jouer cette musique, il la qualifia de «troublante» et poursuivit: «Sa simplicité même est sa merveillosité, car c’est une sorte de simplicité que je n’ai jamais rencontrée auparavant, si éloignée des choses mondaines, si entêtante et étrangement fascinante». L’extraordinairement précoce Charles-Valentin Alkan reçut un premier prix de piano au Conservatoire de Paris à l’âge de onze ans, avant de remporter des récompenses similaires en harmonie et en orgue. Enfant prodige au succès considérable, il s’acquit l’admiration de Schumann et de Liszt mais, pour une quelconque raison, se sentit toujours dans l’ombre de ce dernier. Il goûta l’amitié proche de maintes personnes influentes, dont Chopin et George Sand, mais devint de plus en plus renfermé, peu disposé à se promouvoir tant comme pianiste que comme compositeur. Fait typique de son comportement, il décida de renoncer au poste d’organiste à la synagogue de Paris, avant même de l’avoir accepté, se privant par la même de l’usage d’un orgue Cavaillé-Coll flambant neuf. Même si l’essentiel de sa production est destiné au piano – la plupart de ces pièces requérant une dextérité et une résistance extrêmes –, il composa plusieurs œuvres à moindre échelle pour le piano avec pédalier, un instrument pour lequel il éprouva une tendresse particulière. À partir des 13 Prières, op.64 et des 11 Préludes, op.66, tous écrits vers 1866, son ami et admirateur César Franck sélectionna dix pièces qu’il arrangea pour orgue, se contentant généralement de modifications mineures, surtout des ajustements de tessiture et de figuration voués à rendre l’ensemble plus idiomatique pour l’orgue. La Prière no11 en mi majeur, d’atmosphère pastorale, voit sa section centrale, plus ample, porter la marque Nobilmente, si chère à Elgar. Der in Stuttgart geborene Sir Julius Benedict ging Zeit seines Lebens einer langen, erfolgreichen Karriere als Pianist und Orchesterleiter nach. Er war in Wien und in Neapel tätig und ließ sich schließlich in London nieder, wo er sich allmählich einen Namen als Komponist machte – vor allem mit seiner Oper The Lily of Killarney. Er arbeitete mit Weber und Hummel, doch war seine Musik eher von italienischen Einflüssen geprägt. Rossini wurde dabei eindeutig eine größere Rolle zuteil als etwa seiner Geburtsstadt. Der mit einem zackigen Hauptthema und einem getragenerem zweiten Subjekt versehene March of the Templars wurde gespielt als Königin Victoria 1887 die Westminster-Abtei anläßlich Ihrer Jubiläumsfeier betrat. Die Bearbeitung von W. T. Best, dem gefeierten Organisten der St. George’s Hall in Liverpool, zeichnet sich durch ihre Extravaganz aus und spiegelt seinen legendären Ruf als Solist wider. Sir Henry Walford Davies wurde 1898 Organist der Temple Church in London und verweilte dort die nächsten zwanzig Jahre. Darauf folgten vier Jahre, in denen er sich das Direktorenamt mit George Thalben-Ball teilte, bevor er 1923 die Zügel übergab. Zusammen mit Parry studierte er Komposition und erhielt dabei von Elgar Unterstützung und praktische Hilfe. Doch trotz früher Erfolge mit der Kantate Everyman wurde er nie dem gerecht, was er anfangs versprach. In seiner vielfältigen Laufbahn erlangte er wahren Ruhm als Chorleiter und, am augenfälligsten, als Pädagoge und populärer Rundfunksprecher. Solemn Melody, die berühmteste seiner Kompositionen, schrieb er 1908 für Orgel und Streicher. Wir hören sie hier in J. E. Wests Bearbeitung für Orgel alleine. Die Wiederholung der Melodie, die sich zu einem Höhepunkt für volles Werk entwickelt, wird belebt durch die Harmonisierung und Variationen der Komposition. William Spark war eine schillernde Persönlichkeit und ein produktiver Komponist. Heute ist er uns wohl eher aufgrund seiner nicht selten gewitzten und spitzfindigen Schriften bekannt. Diese illustrieren auf faszinierende Weise das musikalische Leben Englands in der zweiten Hälfte des neunzehnten Jahrhunderts. Ab 1840 nahm er in seiner Heimatstadt Exeter Unterricht bei S. S. Wesley. Als Wesley zwei Jahre darauf nach Leeds zog, begleitete ihn Spark. Er hatte eine Reihe von Posten inne; den Höhepunkt erreichte er mit seiner Anstellung in der St.-Georgs-Kirche von Leeds. 1859 entwarf er zusammen mit seinem Freund Henry Smart die Orgel für das neu errichtete Rathaus von Leeds. Es handelte sich dabei um eines der größten Instrumente des Landes zu jener Zeit. So konnten Sie während der Bauphase in London im Jalousieschweller der Orgel ein Essen geben. In Folge eines im darauffolgenden Jahr veranstalteten Wettbewerbs wurde Spark von W. T. Best zum Städtischen Organisten ernannt. Mit dem Ergebnis des Wettbewerbs waren nicht alle zufrieden, vor allem nicht die Bewohner des nahegelegenen Huddersfield, der Heimat eines Mitbewerbers. Anschuldigungen unsauberer Machenschaften führten zu erhitzten Diskussionen im Stadtrat von Leeds. Spark behielt seinen Posten jedoch bis zu seinem Ableben im Jahre 1897 bei. Nach der Einführung und unkomplizierten Präsentation der Kirchenlied-Melodie Jerusalem the Golden – diese Version unterscheidet sich lediglich in einem Ton von der heute weithin gebräuchlichen Fassung – erscheinen Sparks vier Variationen und das Fugenfinale in traditioneller Form, wobei die charakteristischen Klangfarben der romantischen Orgel voll zur Geltung kommen. Der ruhige Schluß wirkt durch das unerwartete Eintreten seines ausgearbeiteten Abklingens besonders gut. Wenn auch sein Name fast ganz aus den Nachschlagewerken verschwunden ist, so genoß doch Antoine Édouard Batiste zu seinen Lebzeiten enormen Ruhm. Von 1854 bis zu seinem Tode nahm er den Posten des Organisten von St.-Eustache in Paris ein. Als einen der populärsten Solisten seiner Generation kannte man ihn insbesondere durch die Bandbreite seines Repertoires, wie auch aufgrund seines Talents als Begleiter und Improvisator. Wie im Falle seines Zeitgenossen Lefébure-Wély geriet auch seine Musik bald aus der Mode. Und wenn sie auch mehr nach Salon als nach Altar klingt, so zeichnet sie sich doch durch großen melodischen Charme einer gewissen fesselnden Qualität aus. Von seiner berühmtesten Komposition, dem Andante in G, existieren nicht weniger als fünfzig separate englische Editionen, darunter eine für die etwas untypische Besetzung mit zwei Mandolinen und Klavier. William Spark befand die Orgelwerke als gut genug, um sie zur Veröffentlichung auf dem englischen Markt zu bearbeiten. Von der Person selbst war er aber weitaus weniger begeistert; er beschrieb Batiste als einen ‘dicken, pummeligen, rundgesichtigen Herrn voller aalglatter Konversation und Anekdoten’. Das Offertoire in G-Dur hat einen munteren 9/8-Rhythmus mit einem bewegteren Mittelteil, der zu einer stürmischen Reprise der Hauptmelodie führt. William Lloyd Webber, Vater von Andrew und Julian, war ein ausgezeichneter Solist und Lehrer. Lange Jahre war er als Organist in der Central Hall von Westminster und als Direktor des London College of Music tätig. Beim Prelude, dem ersten der Three Recital Pieces aus dem Jahre 1952, entwickelt sich das Eröffnungsthema zu einem rhapsodischen Höhepunkt und schmilzt daraufhin in Richtung einer wunderbar melancholischen Schlußkadenz dahin. In seiner Dreifachrolle als Interpret, Komponist und Nachfolger von Franck und Tournemire von Sainte-Clotilde in Paris trat Jean Langlais das Erbe einer großen Tradition an. Mit seinen Hommagen an Bach, Rameau und Frescobaldi konnte er seinen Stellenwert noch erhöhen. Die 1951 komponierten acht Sätze der Hommage à Frescobaldi beschwören den Geist dieses italienischen Meisters aus dem siebzehnten Jahrhundert – ‘ein Riese unter den Organisten’ – der nicht nur seine eigenen Landsleute inspirierte, sondern auch den Stil von Buxtehude und Bach beeinflußte. Das Thema befindet sich im strahlenden Tripeltakt von Frescobaldis Variations­werken, besitzt jedoch die modalen Inflexionen, die für Langlais so charakteristisch sind. Die drei Variationen sind verspielt und übermütig, und verfügen charakteristischerweise über einen unaufdringlichen Schluß. César Franck verkörpert den Gegenpol zu Künstlern wie Batiste. Wenn er es auch vermag, zum gegebenen Zeitpunkt die Welt des Klamauks seiner Zeitgenossen zu betreten, so bewegt sich seine Musik doch auf erlesenerem und geistigerem Niveau. Diese gehobene Dimension ist am besten in den Drei Chorälen, seiner letzten abgeschlossenen Komposition, erkennbar. Jeder einzelne Abschnitt dieser beachtenswerten Trilogie, die er nach einem Unfall während eines Genesungsaufenthaltes auf dem Land schrieb, verfügt über einen unverkennbaren Charakter. Choral Nr. 1 in E-Dur ist dabei der opulenteste, auf den wohl am ehesten Viernes Beschreibung der Improvisation Francks zutrifft: ‘Eine Polyphonie unvergleichlicher Pracht, bei der sich Melodie, Harmonie und Aufbau in Originalität und emotionaler Konzeption messen und von Phasen offenkundiger Schöpferkraft durchdrungen werden.’ Zu Beginn des Werkes finden wir eine Vielfalt melodischen Materials, das sich im Laufe der drei Hauptabschnitte weiterentwickelt, ausdehnt und verändert. Der zweite und dritte Abschnitt sind durch einen phantasienartigen Teil verbunden. Der dritte Abschnitt nimmt über die Hälfte des gesamten Werkes ein. Die entscheidenden Stellen im Aufbau mögen zwar fest in E-Dur verankert sein, die Flüssigkeit aber, mit der Franck sein thematisches Material durch das harmonische Spektrum hindurch angeht, ist recht beeindruckend. Das Werk endet in einem triumphalen Orkan mit jenem choralartigem Thema, das zuvor schon am Schluß der jeweiligen Hauptabschnitte zu hören war. Das Volkslied ‘Londonderry Air’, das Parry einmal als ‘die allerschönste Melodie der Welt’ bezeichnete, erschien erstmals in gedruckter Form Mitte des neunzehnten Jahrhunderts. Der wohl bekannteste Text zu diesem Stück, ‘O Danny boy’, ist das Werk von Frederick E. Weatherley. Paul Spicer hat es unter dem Titel Dreams of Derry eigens für diese Aufnahme bearbeitet, und läßt dabei seiner harmonischen Phantasie freien Lauf. An einer Stelle ist die Partitur als Würdigung an Percy Grainger, der das Stück zu einem früheren Zeitpunkt bearbeitete, mit ‘louden lots’ gekennzeichnet. Im Jahre 1799 machte Ludwig van Beethoven die Bekanntschaft der Witwe und der Töchter des Grafen von Braunschweig. Als Lehrer der beiden Gräfinnen wurde er bald schon zu einem gern gesehenen Gast auf deren Landsitz. Auf das Betreiben ihrer Mutter heiratete Gräfin Josephine den Grafen Joseph Deym, Inhaber des Wachsfigurenmuseums, für den Mozart drei Stücke für mechanische Orgel schrieb. Beethoven zeigte selbst größtes Interesse an allerlei mechanischen Musikinstrumenten und widmete eigens drei Stücke der Sammlung des Grafen. Zu jener Zeit beschäftigte sich Beethoven vorrangig mit Streichquartetten, und brachte die Sechs Quartette, op. 18, zur Verwirklichung. Die sich zu einem Bogen spannenden melodischen Linien des Adagio in F-Dur könnten auf einen langsamen Quartett-Satz schließen lassen, doch der hohe Grad an detaillierten Ausschmückungen entlarvt es als ein Werk, das ursprünglich nicht für Menschenhand konzipiert wurde. Die Tatsache, daß George Thalben-Balls seine Elegy seinem Vorgänger in der Temple Church, Walford Davies, widmete, zeigt die Wertschätzung und Zuneigung, die er für ihn hatte. Ursprünglich entstand Thalben-Balls Werk als Improvisation im Anschluß an einen im Radio ausgestrahlten Abendgottesdienst. Das Stück verwendet die Grundzüge und die charakteristischen Intervalle der Solemn Melody, und verarbeitet sie zu etwas ziemlich Frischem und Liebenswertem. Der außergewöhnlich frühreife Charles-Valentin Alkan wurde im Alter von elf Jahren am Pariser Konservatorium mit einem Premier Prix für Klavier ausgezeichnet. Später erhielt er ähnliche Auszeichnungen in den Fächern Harmonielehre und Orgelspiel. Als Wunderkind genoß er beachtliche Erfolge und gewann die Bewunderung von Schumann und Liszt. Dennoch sah er sich selbst stets im Schatten des Letzteren. Er pflegte enge Freundschaften zu einer Reihe einflußreicher Persönlichkeiten, darunter Chopin und George Sand, doch zog er sich zunehmend zurück und war nicht gewillt, seine Stellung als Pianist oder Komponist zu fördern. Charakteristisch für sein eigenartiges Verhalten war seine Entscheidung, den Posten als Pianist der Pariser Synagoge niederzulegen, noch bevor er ihn angetreten hätte. Somit entging ihm die Gelegenheit, eine nagelneue Cavaillé-Coll-Orgel zu spielen. Wenn auch die meisten seiner Werke fürs Klavier waren – viele davon verlangten nach außerordentlichem Geschick und Ausdauer – komponierte er auch einige kleinere Stücke für das Pedalklavier, ein Instrument, für das er eine besondere Vorliebe hegte. Aus den 13 Prières, op. 62, und den 11 Préludes, op. 66, die beide um 1866 entstanden, wählte sein Freund und Bewunderer César Franck zehn Stücke aus und bearbeitete sie für Orgel. Die Abänderungen, die er dabei vornahm, waren eher klein und bestanden größtenteils aus Anpassungen der Tessitura und der Figurierung, um diese für die Orgel gefügiger zu machen. Prière Nr. 11 in E-Dur versprüht eine pastorale Stimmung. Der breitere Mittelteil enthält das von Elgar so geliebte Nobilmente. The Temple Church, a private chapel and, like Westminster Abbey, one of the few Royal Peculiars, was consecrated in honour of the Blessed Virgin Mary in 1185 and was completed and dedicated in 1240. Positioned between Fleet Street and the bank of the River Thames, the church has become the place of worship for the communities of the surrounding Inner and Middle Temples, the legal hierarchy of England. A building rich in history, the church has established a musical tradition which has encompassed some of the most innovative and formidable church musicians and organ builders. Little is known about the organs of the church before 1683, except for a mention in an Inventory (1307) that shows that there were ‘In the Great Church Two pairs of organs’. Records exist from 1683 which document the famous Battle of the Organs between ‘Father’ Smith (1630-1708) and Renatus Harris (1652-1708). Both were commissioned to construct an organ in one of the Temple’s two halls, the winner being offered the deed of sale. After much competitive spirit, Lord Chief Justice Jeffreys (of Lorna Doone fame) advised that Smith’s instrument was superior. The organ Smith installed in the church contained the first echo organ in this country and was (in some form) known by John Stanley, organist from 1734, whose playing of voluntaries at the Temple attracted Handel. The Smith organ became the basis of the many reconstructions up to its destruction by enemy action, along with part of the church, in 1941. For over sixty years, Dr E J Hopkins was responsible for additions by, among others, the famous Schulze company. The appearance of the specification of the Temple organ in Hopkins & Rimbault’s treatise The Organ, Its History & Construction perhaps suggests he considered it ideal in specification and design. The present organ was a gift of Thalben-Ball’s friend, Lord Glentanar of Aberdeenshire, whose mansion’s ballroom contained this four-manual Harrison & Harrison instrument. It was built in 1924 and contains many of Arthur Harrison’s tonal characteristics. It was installed in the church in 1954 and occupies a specially constructed chamber on the north side. The only addition at this time was the 32ft extension to the pedal ophicleide rank (the ophicleide rank and solo tuba were placed in a separate expression box); no revoicing was done to the pipework. Between 1973 and 1976 the electrical system was modernized and a general overhaul was made. In 1989 the great harmonics and the swell mixture were remodelled. The great reeds, which previously spoke on 15" wind pressure, were revoiced on the lower wind pressure of 7". A new case was designed by W Emil Godfrey and made by Dove Brothers. Based on drawings of the old 1684 Smith case (removed in 1843), it was installed in 1966. The Temple Church is proud to have secured an instrument whose appearance and tone quality are worthy of its great musical heritage. Since Dr Hopkins founded and developed The Temple’s cathedral-style choral legacy with boy choristers in 1841, the organ has provided accompaniment to the liturgy. Successive Directors of Music – Sir Henry Walford Davies (latterly organist at St George’s Chapel, Windsor, and ultimately Master of the King’s Musick), Sir George Thalben-Ball (whose choir attracted such followings that queues for services often spilled into Fleet Street) and John Birch – continued to enhance the musical tradition. The choir and organ have become worldwide institutions through the many recordings and broadcasts; the world-famous 1927 HMV recording of Mendelssohn’s O for the wings of a dove by Master Ernest Lough and Dr Thalben-Ball received a gold disc for sales of over a million copies. It remains a testament to the extraordinary standard of the choir at that time, and provides a valuable account of the pre-World War II instrument.